Inpatient falls are a significant cause of hospital acquired conditions (HACs)(AHD, 2015). The Agency for Healthcare Research and Quality estimates the U.S. national incidence of fall-related HACs to have been approximately 260,000 in 2010. The interim U.S. national estimated incidence of fall-related HACs remained unchanged at 260,000 in 2014 (AHRQ, 2015). This course introduces the scope of this patient safety risk. The reported inpatient fall rate varies widely in the literature. A recent, significant study of the inpatient fall rate found that rates varied within and among hospitals with a range from 1.3 to 8.9 falls/1,000 patient days depending upon the type of hospital and the hospital unit (Degelau et al., 2012). Of the patients who fall, 3% to 20% will sustain an injury, 6% to 44% of those injuries are serious, such as fractures, subdural hematomas, excessive bleeding all of which can lead to a death. Even minor injuries can cause delay in recovery (Oliver et al., 2010). Not only are the patient, family and community affected by falls, but everyone bears the expense of rising healthcare and hospital costs. Increased hospital costs can vary depending on the extent of injury from a fall: one hospital fall without serious injury has been shown to increase costs by $3500; two or more falls without serious injury can lead to a $16,500 increase in cost; falls with serious injury can cost an additional $27,000 (Wu, et al., 2010). The U.S. health care industry is beginning to respond to this economic challenge. The Agency for Healthcare Research and Quality (AHRQ) reported in its handbook, Patient Safety and Quality: An Evidence-Based Handbook for Nurses), every year inpatient falls resulted in 90,000 serious injuries and 11,000 deaths in American hospitals (Hughes, 2008). In 2008, the Centers for Medicare & Medicaid Services published the final rule for their Inpatient Prospective Payment System (IPPS) in compliance with the Deficit Reduction Act of 2005. Falls and fall related injuries are considered preventable conditions. This addresses the fractures, dislocations, intracranial injuries, crushing injuries, burns and electric shock associated with hospital falls and trauma. http://www.cms.gov/HospitalAcqCond/01_Overview.asp#TopOfPage. http://www.cms.gov/HospitalAcqCond/06_Hospital-Acquired_Conditions.asp. According to Medicare, following October 1, 2008, “hospitals will not receive additional payment for cases in which one of the selected conditions was not present on admission. That is, the case would be paid as though the secondary diagnosis were not present.” http://www.cms.gov/HospitalAcqCond/01_Overview.asp#TopOfPage. http://www.cms.gov/HospitalAcqCond/06_Hospital-Acquired_Conditions.asp. When a Hospital Acquired Condition does occur, all inpatient acute care hospitals shall identify the charges and/or days, that are the direct result of the HAC. Such charges and/or days shall be removed from the claim prior to submitting to the Health Plan for payment. Current and valid Present on Admission (POA) Indicators (as defined by CMS) must be populated on all inpatient acute care hospital claims. In no event shall the charges or days associated with the HAC be billed to either the Health Plan or our members. https://www.anthem.com/provider/noapplication/f1/s0/t0/pw_e170997.pdf? Additional policies have been promulgated that effect Medicare reimbursement. Hospitals are required to report data on specific quality measures, including fall rates. Hospitals who do not submit this data receive payments that are 2% lower than hospitals that do submit this data. Effective October 1, 2014 the HAC reduction program reduces Medicare payments to inpatient hospitals that have HAC scores that put them in the top 25%, the worse performing quartile, for all hospitals reporting on acquired conditions. Hospitals are given a total HAC score which is a composite measure of the Agency for Healthcare Research and Quality (AHRQ) Patient Safety Indicator (PSI) 90 composite measure, the Centers for Disease Control and Prevention, National Healthcare Safety Network (NHSN) Central Line-Associated Bloodstream Infection (CLABSI), Catheter-Associated Urinary Tract Infection (CAUTI) and Surgical Site Infection measures. It must be noted that in some instances the fall rates of hospitals have increased due to intrinsic patient factors, i.e. older, sicker patients, and also because of extrinsic factors like improved accident reporting and systems that focus on fall prevention and Medicare reporting requirements (Weil, 2015). Falls without serious injury have little financial impact. The American Hospital Directory (AHD). Quality Definitions and Methodology, Hospital Acquired Conditions. Updated 2015. Degelau, J., Belz, M., Bungum, L., Flavin, P., Harper, C., Leys, K. et al. (2012). 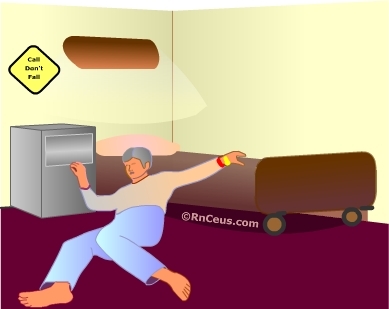 Prevention of falls (acute care). Health care protocol. Bloomington, MN: Institute for Clinical Systems Improvement (ICSI), 43. Wu, S., Keeler, E. B., Rubenstein, L.Z., Maglione, M. A. & Shekelle, P. G. (2010). A cost-effectiveness analysis of a proposed national falls prevention program. Clin Geriatr Med., 26(4):751-66. Centers for Medicare and Medicaid Services (2011). Hospital-acquired conditions. Hospital-Acquired Condition Reduction Program. Medicare.gov. Weil, T.P. (2015). Patient falls in hospitals: An increasing problem. Geriatr Nurs., 36(5)342-7.